Huge Savings! Up to 11% off on Beets at Love for Salad. 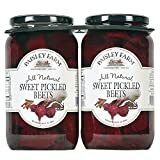 Top brands include Eternally Herbal, Amish Wedding Foods, Aunt Nellie's, Paisley Farm, Lowell Foods, Manischewitz, Rick's Picks, Frontier, Hengstenberg, & S&W Manufacturing. Hurry! Limited time offers. Offers valid only while supplies last.